This listing is for a ring kit featuring one of my lampwork glass beads. 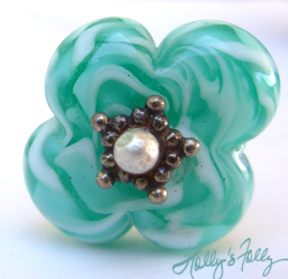 The bead is a aqua floral shaped disk bead measures 6 mm tall and 18 mm wide. To read more about the rings and what you will be getting, READ THIS LISTING. I admire your work. Gorgeous glass beads.